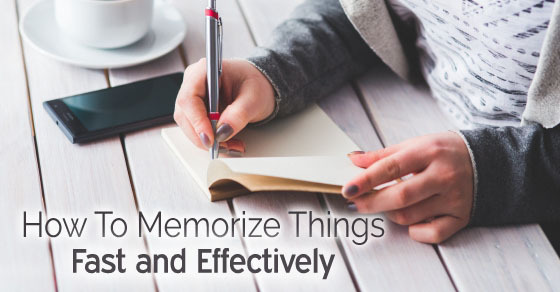 Memorizing things quickly is an important talent to have. It can be quite useful for students, but also later in life. Memorizing things fast is not a natural ability. It is a technique that you need to practice a lot. Here is how to memorize things fast. The chaining method is great for shorter lists of bunch of different items that have no relationship to each other. Just make a sentence or image composed of all the items you have to memorize. The weirder your sentence or an image is, the easier it will be to remember the list. This is really helpful when trying to memorize a speech. You should record yourself reading the speech aloud and listen to yourself speaking. It’s especially good strategy for auditory learners. If you are trying to memorize a large amount of facts, you need to relate them visually in your mind. You can do that by making a memory construct, such as tree with big branches and leaves. Big branches should hold most important information and you should assign pertinent details subordinate to each branch as leaves. It’s been well known that we remember bits of information better if we chunk them. Chunking works well when you’re memorizing things that are composed of smaller things in a sensible order. With this technique, you will think carefully about what you are reading. After you summarize everything you’ve read, it’s just a way of teaching it to yourself again. Those are some techniques that are proven to be successful when you need to learn something fast. Also check out this quick and easy challenge to help you discover the natural power of your memory.